“Peña Nieto and Velasco Coello, government officials involved in the policies of counterinsurgency in Chiapas” – Frayba. Fray Bartolome de Las Casas Human Rights Centre (Frayba). The attack on and extrajudicial execution of the Zapatista teacher Galeano on 2nd May, 2014, marks a momentous event in the context of the Armed Internal Conflict in Chiapas, consisting of the inclusion in the Mexican government’s war against the EZLN of other actors who at its beginning promoted the campesino struggle for land rights. Now the members of the Independent Central of Agricultural Workers and Campesinos (CIOAC-H) are part of the theatre of war, creating an armed “self-defence” group, allowed, encouraged and strengthened by the structure of municipal government, with Manuel de Jesús Culebro Gordillo, mayor and leader of the CODECH, an organization which in March 2014, formally joined the ranks of the PVEM through the fundación Tierra Verde A.C (Green Earth Foundation), a political organization headed until recently by the Secretary of State of the Government of Chiapas Eduardo Ramirez Aguilar. All of these have become useful players in the counterinsurgency war. 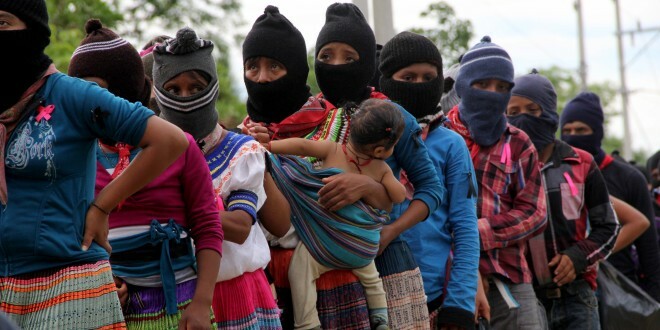 The ambush of BAEZLN on 2nd May 2, 2014, in the territory of the JBG of La Realidad, had as a consequence the extrajudicial execution of the Zapatista teacher Galeano. With violence, they brutally destroyed the Autonomous Clinic and School, acts which tried to undermine Zapatista autonomy in its construction of another social and political system distinct from the decadent neoliberal system. Having documented the situation, this Human Rights Centre considers that the Mexican government is responsible for the extrajudicial killing, assaults and harassment of BAEZLN, placing responsible directly on members of CIOAC-H led by Luis Hernández Cruz and José Antonio Vázquez Hernández, authorities of the ejido La Realidad, and members of the PAN and PVEM, in complicity with Gaudencio Jiménez Jiménez, Florinda Santiz, and Manuel de Jesús Culebro Gordillo, public officials of the municipal administration of Las Margaritas. We also identify the following government officials as being involved in counterinsurgency policy: Enrique Peña Nieto, head of the federal government, commander of the Armed Forces which harass the EZLN and implementer of social projects which generate division, dependence and divide the communities and towns of Chiapas; Manuel Velasco Coello, Governor of Chiapas and political operator of federal programmes for the actions of counterinsurgency and protector and funder of organizations like CIOAC-H.
By its intervention, with varying degrees of responsibility and participation, in the ongoing repressive actions expressed in state violence against BAEZLN. By its direct and indirect participation, through action or through omission, in the committing of crimes against humanity, which are specified in the following human rights violations: extrajudicial execution; forced displacement; arbitrary imprisonment, torture, persecution of a group or community with its own identity based on political and ethnic motives, serious injury to the physical and psychological integrity of the people and organizations who fight for autonomy. By failing in its duty to promote, respect, protect and guarantee human rights, and to prevent, investigate, punish and redress human rights violations, leading to a situation of structural impunity. In Chiapas, the government of Mexico with its institutions violates the right to life, security and personal integrity, to Free Determination expressed in the Autonomy of the Peoples, based and grounded in the instruments of strict compliance by the Mexican State such as: the San Andres Accords, Convention no. 169 of the International Labour Organisation and the United Nations Declaration on the Rights of Indigenous Peoples. So also with regard to the American Convention on Human Rights of 1969 and the Covenants: Civil and Political Rights; and Economic, Social and Cultural Rights of 1966 and their respective additional protocols. This counterinsurgency action is related to the interests of territorial control and violates the collective rights to land, territory, natural resources, self-government, autonomy and self-determination.